For those who do not read Portuguese, the title of this post is “Popularization of science through podcast”. During my visit to Brazil last month, I was interviewed by a Ph.D. student, Luiza Montenegro Mendonça, from the Federal University of Rio de Janeiro. Luiza is taking a course on scientific divulgation, and students are required to produce a podcast each week which is published on the course website. Luiza’s brief (~5 min) conversation with me can be found on the ICB (Instituto de Ciências Biomédicas) website, and it’s available in both English and Portuguese. If you read Portuguese, you should also check out the home page of the ICB website. 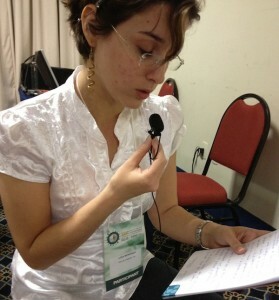 Luiza is very interested in teaching the public about science, but does not feel that podcasting is right for her. Instead, she plans to write a science blog in Portuguese. When her blog launches we will be sure to note it here.